STUD SERVICES: The following males are available only to those females of merit with OFA Health Clearances owned by Code of Ethic Breeders. Multi-BIS/BISS/AOM CH Von Baker's Carbon Copy CD, TT, HIC, MRC Hall of Fame, Ch in 8 countries, 2pts from Bronze, "Ditto" Producer of Ch BIS Working and Temperament titled offspring. CH Von Bakers Hop On A Bus Gus, MRC "96 WD & "98 Stud Dog Producer of Ch, Group Placing & CHIC registered offspring, "Gus"
Multi AOM Am/Can Ch Rottihaus No More Mr Nice Guy, Hoosier '02 WD, NSRC & ARC Reg. 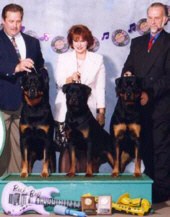 '00 RWD & Group Placer "Kody"
Am/Can Ch Von Baker's LIke A Rolling Stone, Group Placer & Multi BOB Winner, ARC '01 National 6-9 mos. Winner "Dylan"